To enhance the wireless mobility , the Wireless File Transmitter WFT-E6A supports IEEE 802.11n to provide an even faster and wireless-only LAN connection - including an all-new internal Bluetooth function. A rugged and lightweight construction enables the user to shoot in harsh environmental conditions. And because the WFT-E6A can work wirelessly, this file transmitter delivers the versatile performance and functionality that professionals demand. 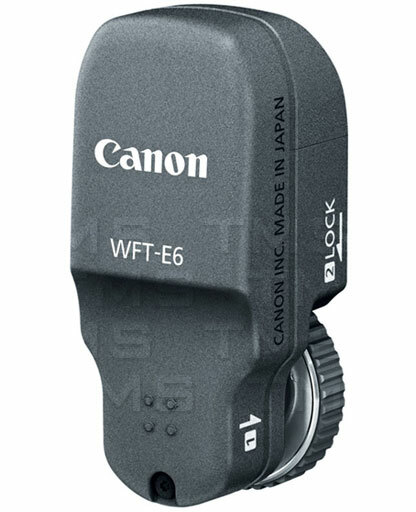 The new WFT-E6A is compatible with the EOS-1D X and offers a wireless-only LAN function for enhanced versatility when transferring data. It now also supports IEEE 802.11n to provide safer and faster wireless LAN transfers than previous models and has a new image resend features that ensures all images get transferred, even if a wireless signal drop interrupts transmission. Wireless connectivity is gradually becoming an industry standard; many photographers are seeking convenient methods to transfer important image data securely and faster without the use of cables and wires. Canon developed the new WFT-E6A to support IEEE 802.11n, which provides seamless wireless transfers of large files at a speed roughly 3x faster than previous transmitters. For even more versatility, an internal Bluetooth function (Bluetooth v2.1 + EDR) is included. Bluetooth v2.1 + EDR allows the transmitter to have a secure connection to Bluetooth-compatible GPS devices while handling high-volume data transfers. Syncing cameras just got easier with the WFT-E6A's new wireless time syncing feature. Although time synchronization can be performed by the EOS-1D X via wired LAN connection, the WFT-E6A provides the option to do it wirelessly. Event photographers will find this especially convenient as now its possible to make adjustments without having to use a direct connection to a computer. Portability is just as important as how well a product functions. Offering a compact design, the WFT-E6A is lighter and smaller than its predecessors. Built to withstand inclement weather, this transmitter has the same dustproof and waterproof construction used in the EOS-1D X body. A compact and durable design ensures that equipment can be safely brought into rough environments, making the WFT-E6A an ideal accessory for demanding photographers constantly on the move. No different from other wireless file transmitters, the WFT-E6A still retains the linked multi-camera shooting function. It's possible to link up to 10 cameras to take a picture of one subject simultaneously. An enhancement improves linkage to a WFT server by allowing it to start simultaneously when the master camera and slave cameras are manually connected. Each slave camera will have its own IP address to gain access to the server allowing the user to conveniently browse and load images. If desired, when the user accesses the master camera to release the shutter, the slave cameras, in turn, will perform the same action in coordination.